A Name Perpetual (hanow a bes vynytha) was commissioned in 1996 for the Cornwall Youth Wind Orchestra by Keskerdh Kernow, an organisation formed to promote Cornish culture and to commemorate the Cornish Rebellion of 1497, when the people of Cornwall rose up against the monarchy. Under the leadership of Michael An Gof and Thomas Flamanck, a Cornish host, sometimes estimated to number as many as 15,000, marched to London in protest against excessive taxation. Arriving at Blackheath, they were attacked by the King’s army, defeated, and the two rebel leaders were hung, drawn and quartered. On his way to his death, An Gof stated that he would have “a name perpetual and a fame permanent and immortal”. A Name Perpetual tells, in four scenes, of the anguish of the Cornish people, the march to London, and the Blackheath Skirmish, ending with a lament for the lost Cornishmen. The music includes strong elements of the Celtic music tradition, being structured around an old Cornish folk tune. 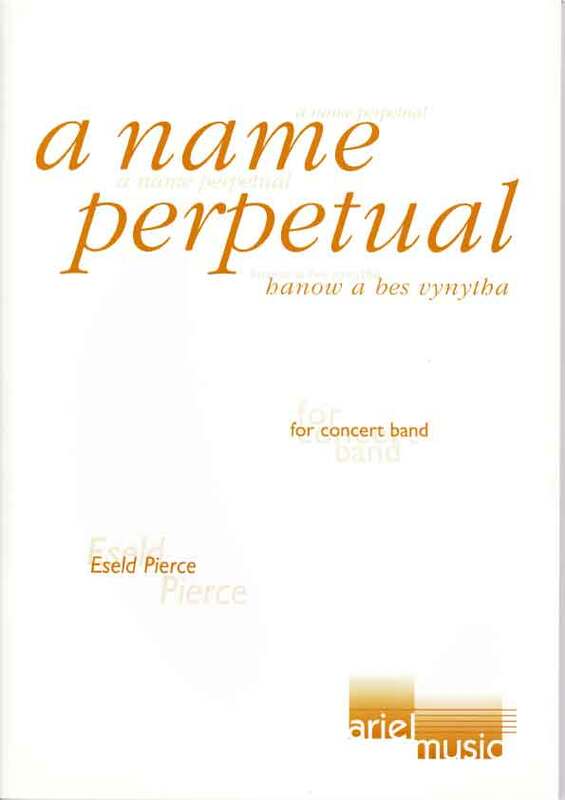 An outstanding success was scored by the young Cornish composer Eseld Pierce with her programmatic A Name Perpetual, an imaginative and moving evocation of a Cornish rebellion. Eseld Pierce evokes the battle against the Monarchy using Cornish folk music. Although the means are modest, the result is so moving that the listener needs silence at the end. A sensational work which deserves a wide audience.